Chuck Klosterman has a story in Esquire magazine called "The 'Snakes on a Plane' Problem: The tragedy of the best-titled movie in the history of film." The truth is, I don't think "SOAP" is such a great title, just a generic one. I can think of a lot of others I think are funnier or more effective or more creative -- from "Eraserhead" to "Beneath the Valley of the Ultra-Vixens" to "O Brother, Where Art Thou?" to "Talladega Nights: The Ballad of Ricky Bobby" (2005) and the upcoming "Borat: Cultural Learnings of America for Make Benefit Glorious Nation of Kazakhstan." "Snakes on a Plane" is like the Wikipedia version of a movie. A year ago, New Line Cinema planned to change the title to the ultraforgettable "Pacific Air Flight 121," but everyone who cared (including its star, Samuel L. Jackson) freaked out. That reaction was understandable; the one thing everyone seems to agree upon is that "Snakes on a Plane" is a funnier, more expository, paradoxically intriguing moniker. If a film never takes itself seriously and originates as satire, everything is different; its badness means something else entirely. "SOAP" doesn't fit into either category: It doesn't take itself seriously, but it's not a satire. It will probably be unentertaining in a completely conventional way. Which, apparently, is what people want. They want to see "Snakes on a Plane" in order to tell their friends that it's ridiculous, even though a) that's the only thing everyone seems to know about this movie, and b) that's been the driving force behind its marketing campaign. It's not a bad movie that's accidentally good, and it's not a good movie that's intentionally bad; it's a disposable movie that people can pretend to like ironically, even though a) it's not ironic and b) they probably won't like it at all. 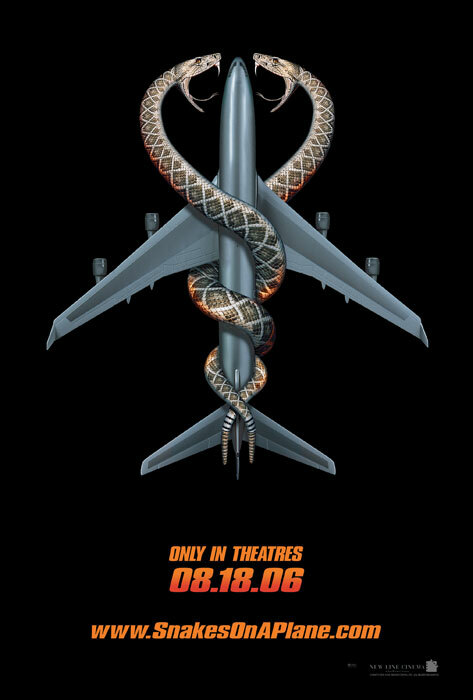 The only purpose of "Snakes on a Plane" is to make its audience feel smarter than what it's seeing. Which adds up, since that's part of the reason people like reading the Internet. I wish this movie were still called "Pacific Air Flight 121." Really. That would be so much worse, but so much better. What a blessed relief it will be on Friday, when there's actually a movie to respond to. Not that I intend to see it. As far as I'm concerned, it may as well be called "Kitties on a Plane." I just don't think snakes are inherently scary or creepy -- not like, say, "Patchouli on a Plane," the thought of which makes me sneeze and feel nauseous -- although I suppose poisonous ones or constrictors are to be avoided in the overhead bin or the seat pocket in front of you, especially when the "Fasten Seat Belt" sign is illuminated. But I feel like someone should pay me if I have to hear Samuel L. Jackson say that m-----f----n' line again.